Eaton ePDU are designed specifically for data centers and IT environments. Eaton’s data center ePDU’s range from basic power distribution to the ability to monitor and manage power consumption. 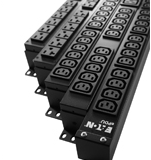 Designed for reliable and cost-effective power distribution, Basic ePDUs have the form factor and receptacle choices to meet the needs of the demanding data center architect. With power levels ranging from 1.4 kW all the way to 17 kW, Eaton has the right Basic ePDU for any application. Eaton Monitored ePDUs provide remote monitoring of the current draw of individual sections via Ethernet or Serial communication. This capability, combined with state-of-the-art software allows you to aggregate the information from thousands of ePDUs in one location. 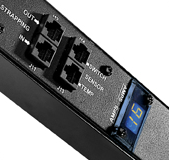 All Monitored ePDUs also include the Easy-Read digital LED ammeter for easy start-up and provisioning of servers. Designed for high-density, mission-critical server applications, the Advanced Monitored ePDU provides maximum power for both standard and blade servers. Employing multiple configurations, the Easy-Read LCD screen and remote power management feature distinctly colored circuits, ensuring easy management and monitoring of the ePDU down to the outlet level.